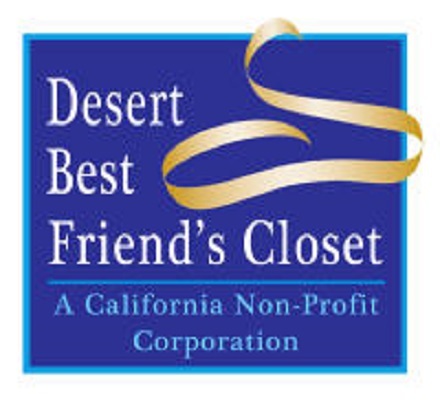 Desert Best Friend’s Closet, a non-profit dedicated to providing a Bridge to Employment with wardrobe and job search services, is hosting its Third Annual – Put Your Best Shoe Forward – fundraiser on Friday, April 7, 2017 at Agua Caliente Casino Resort Spa from 11a.m. to 1p.m. The annual luncheon and fashion show is the primary fundraising event for the organization that serves over 500 women and men annually. “We are proud to provide an initial business wardrobe and image services to those who want help in dressing appropriately for employment success” notes Connie Golds, Executive Director. Desert Best Friend’s Closet typically provides three complete business outfits that include shoes, accessories and handbags, for ladies. While the organization always accepts clothing, shoes and accessories, funds are needed to make supplemental clothing purchases for clients. “This fundraiser helps us fill in where our clothing donations fall short. When you provide dresses, suits, handbags, shoes and accessories for clients in all shapes and sizes, it’s important that we have a wide range of clothing so that our clients have an initial wardrobe that helps them feel good about themselves so that they can put their best foot forward” Ms. Golds concluded. The organization receives generous donations of clothing from throughout the Coachella Valley. Some of the clothing donated is styled for special occasions or more casual settings. The Boutique at Desert Best Friend’s Closet provides an outlet for the organization to sell these pieces to the general public. Select fashions from the Boutique will be featured at the luncheon.